We like leaked videos of unannounced products here at Redmond Pie, and we really like videos that are 100% real. 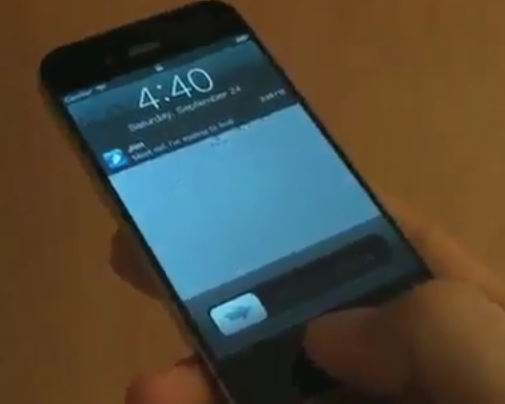 Unfortunately this new video of what is claimed to be an iPhone 5 is almost certainly, 100%, nailed on, fake. Discovered by the always fun TechCrunch, the video shows what is supposedly the iPhone 5 in all its glory, and the person behind the hoax has done their homework. Notice the large, edge-to-edge screen and thinner bezel? They’re both characteristics that are believed to be present in the real iPhone 5. If a real iPhone 5 actually exists that is, and we’re not going to get a souped up iPhone 4 when Tim Cook sets foot on Apple’s stage next week. So, why are we so sure this isn’t the real deal? Well, just watch the thing. Taps don’t seem to register where they were made, icons don’t fit correctly, and that screen just doesn’t ‘seem’ right. The hints are subtle and a few could be just artifacts of the low-quality recording. For instance, the size of bezel on either side of the screen seems to slightly shrink and grow throughout the video. The user’s finger placement is also relative to the iPhone 4′s smaller 3.5-inch screen. He seems to unlock the phone and launch apps by using a screen smaller than what’s shown in the video. Finally, as GSMarena notes, the dates on the home screen and lock screen do not match and the game starts prior to the user hitting the screen. So yeah, the video is clearly not real. Yep. That’d pretty much do it, then, but we’ve got to give them a hearty A+ for effort, haven’t we? To the untrained eye, that’s one impressive hoax. So that leaves us pretty much where we were before we spotted the video – almost completely in the dark. If we could just agree on whether the next iPhone will be a complete redesign or not, this rumor-squashing lark would be so much easier, but with claims and counterclaims for and against both potential outcomes, we’re really just clutching at straws. With the Apple iPhone event taking place in Cupertino in five short days, we can at least take solace in this – we’ll know for sure, soon enough!